Fair Trade dark chocolate from South America combined with lemon and ginger for a well balanced and refreshing flavour. Finished with a hint of black pepper, this organic dark chocolate bar is a must try for chocolate fans, plus is gluten free, dairy free and suitable for vegetarians – everyone is bound to want a taste. Organic Chocolate Liquor, Organic Raw Cane Sugar, Organic Cocoa Butter, Candied Ginger (Organic Raw Cane Sugar, Organic Ginger), Organic Unrefined Whole Cane Sugar, Black Pepper, Organic Lemon Oil, Organic Ground Vanilla Beans. 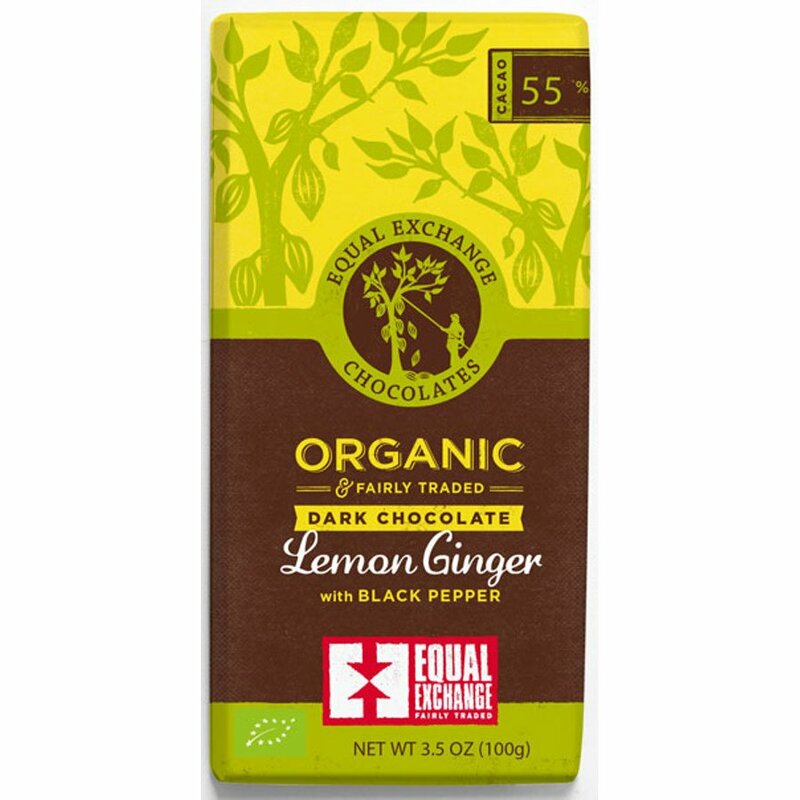 The Equal Exchange Organic Lemon Ginger With Black Pepper Chocolate - 100g product ethics are indicated below. To learn more about these product ethics and to see related products, follow the links below. Not tried yet so only hoping it is as good as it looks and sounds. Personally I find this chocolate wickedly delicious and have to severely ration myself! Okay but it's one of those things that sound better than they taste in reality. I got it as a freebie so can't complain too much, but wouldn't buy it myself. There are currently no questions to display about Equal Exchange Organic Lemon Ginger With Black Pepper Chocolate - 100g.